I unexpectedly found myself downtown last Saturday with about 1.5 hours of spare time on my hands. Strangely, as soon as I noticed this amount of spare time it was gone as I was immediately headed for the Arb. Hey, it is September after all, in case someone out there had expected a different use of my 1.5 hours in downtown Ann Arbor. I had barely entered the Arb when I heard a flock of Chickadees, a dead ringer for migrant warblers and sure enough, just seconds later I found myself surrounded by the most breath-taking assembly of warblers I have ever seen. During the 1.5 hours spent there on the same spot, I was constantly surrounded by at least 10 individuals and usually got a choice of 3-5 species at any given moment. All in all, I found 13 species of warbler within the flock that I estimated at holding more than 120 individuals. 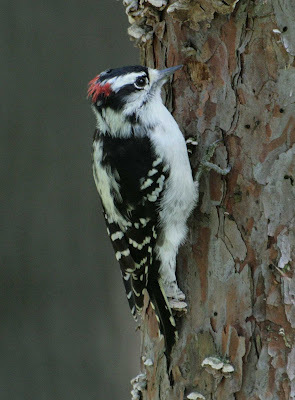 During this warbling frenzy, to get to the point of this post, I heard a distinctive tapping, neither of an Ivory-billed Woodpecker, nor of a Raven at my door, but of a nearby Downy Woodpecker. 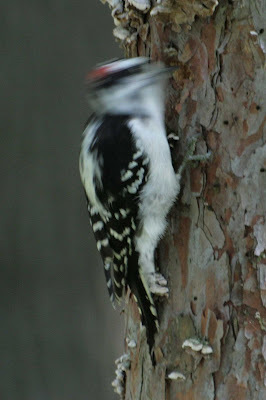 Now here's something I find interesting, as it causes me to be angry at myself time and time again after each birding holiday: I usually have a pile of pictures of rare or unusual species, but always completely forget to photograph the common ones, the Downy Woodpecker being one of them. 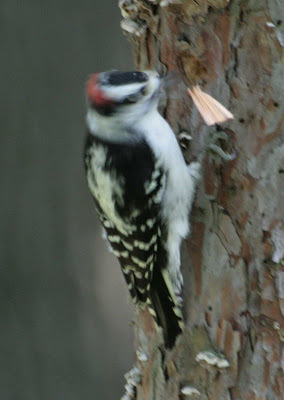 This may explain why, in the presence of warblers, I grabbed my camera and went looking for the Downy. I didn't have to look for a long time as by lucky coincidence, a nice male Downy was just 10 metres away at eye level and very busy taking apart a small log to get to what must surely have been a very worthy maggot. This was it, the chance, the golden opportunity, but alas, the light was dim and the shutter speed grim: 1/60th at a speed of 800 ISO and no tripod. 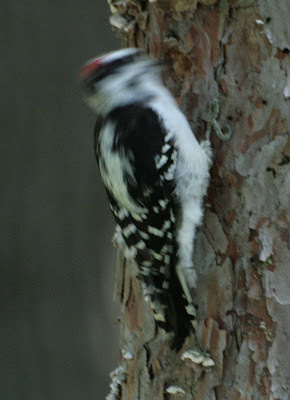 Any movement by myself or the woodpecker, I knew, would inevitably lead to nothing but a crappy black-and-white blur with a red dot somewhere mixed in. Which was not what I wanted. 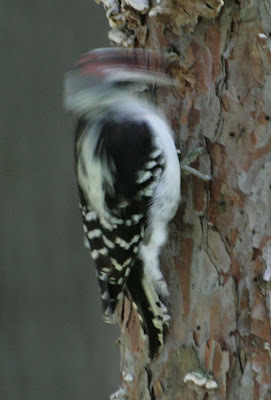 The woodpecker himself - who certainly valued a good meal more than having a good picture taken of himself - did his very best to not cooperate by literally constantly pecking away at the log. In between his vigorous bursts of pecks however, he remained still for quite a bit less than a second to check the surroundings and I had high hopes of catching him on film (as the old folks still call it in the digital age) in that very fraction of a second, crisp and sharp. Well, you may say these pictures express the dynamics of the woodpecker's movement nicely or that the shades of grey mixed with the sharper areas of black and white are an artistic approach to photographing a woodpecker but honestly, these pictures are just rubbish. As the warblers were still flowing - now unidentified - through my peripheral field of view and I really didn't have all day for that blinking woodpecker, I decided to give it a massive frontal digital attack: I put my trusty old Canon Digital Rebel XTi into Continuous Shooting at a rate of 7 images per second (I think), aimed, focused and fired! It never had a chance now, did it, against the full force of 21st century photography? But still, it was ugly: 4 seconds of continuous photography, frame after frame, hammering down mercilessly onto the innocent creature. Admittedly, it is still not the sharpest of pictures, but considering it was taken at 1/60th and of a fast moving bird, it is quite a shot I'd say. I am happy with it, and hope you like it, too. Returning to the warbler flock, I was exhilarated to see a nice (probably first fall) female Cerulean Warbler. This was only my fourth visual encounter and it even scares me now, after almost half a week, as this is what it says in the "Peterson Series" guide on Warblers: "This species is very rare in fall in the northern Midwest..."
This was indeed such an unusual observation that someone from the "list" (email-forum) contacted me and asked for details. Well, he asked if it was a male or female, but I guess this was just a polite way of asking if I was sure about what I had seen and minded writing up a short description. A few readers may note - with pity or relief - that I did not see a Cape May Warbler that day, a bitter miss. I actually have yet to see a fall Cape May Warbler at all, just like I haven't seen a fall Orange-crowned, or Palm, or Kirtland's, and not even a single fall Colima Warbler! Well, I guess I just have to return to North America then, one day soon. What do you have when you're immune to a small amount of aluminum? If you do not have an image stabilized lense, a Bush Hawk would help wonders with being steady while taking pictures, especially when taking pics at a slow shutter speed. I never leave home with out mine, and it's a very good investment. Google Bush Hawk, for more info. The most recent article on my site has a picture of me using mine. Let's see: bird 50, Jochen 1. Sounds about right. No Ivory Billed Woodpecker? Darn! Wonderful list of warblers! WOW!